I bought a pair of Chaco’s today. Considering that I’ve been out of a job for over two years now that may seem somewhat irresponsible. To be honest, it was a bit out of character for me, (although I did get them 40% off with free shipping). I am, after all, the woman who’s worn a pair of cheap $5 flip-flops for the last three summers. However, that’s probably equally foolish considering I have arches that rival those of the ancient Romans. Maybe it was a moment of impulsiveness or reckless spending or maybe it was the beginning of a new way of thinking and acting for me. I recently read a piece where the author was wrestling with the idea of being “rich enough to be poor”. Apparently, it’s an old Russian saying implicating the idea that if you buy cheap things, it will cost you more in the end. So, in theory, you have to be wealthy to buy cheap. Makes sense, right? Well, I think it’s much more complicated in the practical world than it is in the theoretical world, (isn’t that always the case?). After all, if you are already strapped for cash, how do you buy more expensive, higher quality items? Well first of all, no one is saying that we have to have the best of everything. That’s an entirely different, (and equally misleading) mentality. I’m not talking everything. I’m talking some things. If we take a hard look at what we throw away -and how that’s changed in the last 100 years or so, we see some alarming patterns that I think not only represent a facet of our family economic systems but that also of our larger consumer economic systems. Data from New York City Waste Collections indicates that the amount of garbage created per person per year went from 92 to 1,242 pounds from 1905-2005. Granted, packaging and containers represent 32 percent of that number, (and that’s another topic to be discussed). However, non-durable goods (products used less than three years) represent 27 percent or roughly 335 pounds a person per year. That’s 335 pounds of junk we each purchased last year that wore out, broke or stopped working too soon, (my flip-flops probably should be in that number, but I’ve resurrected them a few times with super glue). That number alone is about 3.5 times more than the entire amount of garbage per person in New York 104 years ago. Granted, things have changed since then. At some point, however, we need to start asking if this pattern is played out over time, where will we be? Is it something we can afford to continue? So back to the family budget. How does buying cheap affect us and why do we feel compelled to do it? Well, let’s first take into consideration our extremely human and early-showing tendency to want more. Planned obsolescence or built-in obsolescence is the process of a product becoming obsolete and/or non-functional after a certain period or amount of use in a way that is planned or designed by the manufacturer. The purpose of planned obsolescence is to hide the real cost per use from the consumer, and charge a higher price than they would otherwise be willing to pay (or would be unwilling to spend all at once). That cheap computer that tanks on you in 18 months isn’t so cheap after all. Not when you have to keep replacing it, (even if it’s only one piece at at time). Which, apparently was the plan all along. A little bit maddening isn’t it? It costs us more money, it ends up as more waste all while we are encouraged to be in a perpetual state of the Greedy Gimmees. I can tell you from experience, the Greedy Gimmees push gratitude right out the back door. And life without gratitude is not very satisfying. So what do we do about this? First of all I’d like to give kudos to the Brits for taking a stance on it. In the UK, it’s considered a breach of consumer rights to engineer obsolescence into products. They investigate claims of products that consistently fail just outside the warranty period, (just ask Apple). Do research to find quality items that last. Before you purchase something, do a little research about the product. Find companies that are interested in longevity and quality, (they are out there). Use the internet to look at the vast review sites for various products. If you see complaints that a product is failing just on the other side of the warranty date -avoid that product. Don’t count out second hand stores! If the product made it to a second hand store it just might have a better chance of longevity. Sift through the thrift stores and see if you can find a useful treasure that will serve you for years. My favorite coffee mug is a unique hand-made stone wear thrift store find, (it warms up like the beach in the sun…). It cost me .99 and I use it every single day. Don’t be an impulse buyer. Impulsive buyers are the manufacturers best friends. They are the ones that planned obsolescence is tailored to. Impulse buyers buy into the ideas of bigger, better, more. No matter what you hear, you probably don’t need it right now. There is very little, (outside of oxygen…and coffee?) that we need right now. In fact, it would probably be good practice to let those impulsive feelings pass. Once you’ve ridden that wave without buying you will realize it wasn’t so urgent after all. The next time those feelings arise, it will be easier to wait them out before you make a buying decision. The name of the game in bucking the disposable society is delayed gratification. Plan on using the item for the long haul. Fight the urge to go with the “Bigger, Better, More!” mentality. If you buy a quality product, then tell yourself you are going to use it for X amount of time -and stick with it. You will learn several things. 1. That you can get by without something bigger and better and 2.That those, (seemingly dire) urges to buy more are just that , urges. If you happen to be walking by the next generation of whatever you have, put your blinders on, remind yourself you made a commitment to fight the disposable lifestyle and keep walking -just let that urge pass on by you. Sometimes, when I realize how enslaved our entire economy is to the idea of a disposable society, (some have argued that it was planned obsolescence that brought us out of the Great Depression) I wonder if our economy can survive otherwise. However, I know that people are endowed with this desire to have meaning in their life -to have their work mean something to themselves and to others. I’m just not sure manufacturing a ton of cheap junk is all that meaningful to anyone. Maybe, we could trade our disposable society for one that encourages high quality, carefully made items that will be with people for years. Maybe then we could afford to buy more expensive items and we could afford to pay the people who make them a fair, livable wage. And instead of being in a state of the perpetual Greedy Gimmees we could instead be in a state of perpetual gratitude for the care that was put into the items that go with us and gather memories during our lives. I’m on a food bent today. Do you love really good, organic yogurt but feel like the budget is too tight to buy it? Perhaps you just feel wasteful buying disposable, (or recyclable) container(s) of yogurt every week. You can make your own yogurt and it is EASY. Really. No laboratory needed, no big sterile environment is necessary. Just you, some milk, some culture and a warm place. Yogurt is one of those things that is as old as man and domesticated livestock. If they could do it, so can we. -and the best thing is you control what goes into it. I use a 1-quart “Yogurt Maker” by Salton. I got it from Amazon for about $15. I now see that Amazon no longer carries it. 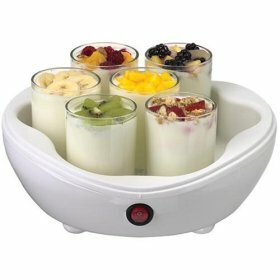 However, they do have an individual cup yogurt maker for $29. I’ve often wished I had the options of individual cups so perhaps this is a better option anyway. You can make yogurt without a yogurt maker but I’ve found the incubator is inexpensive and makes the process much more predictable and the product more consistent. Regardless, the process is the same. You buy milk -whatever milk you desire. I love using whole-milk for my yogurt. If you use homogenized milk your yogurt will be consistent throughout. If you use milk that has not been homogenized your yogurt will have a cream layer on top, (oh, how I love that cream layer!). You heat the milk to 200 degrees for 10 minutes. You let it cool until it is lukewarm. Some people add some dried milk powder at this point but I’ve found it isn’t necessary. Next, you take some live cultures and mix them into the milk. You can either use live culture that has been freeze-dried, (like Yogourmet) or just buy one cup of plain yogurt that has live and active cultures to mix into your milk. You then place the milk/culture mix in the incubator and let it rest for 4-10 hours -until it sets. If you like your yogurt more sour then let it go towards the 10 hour mark, mild let it go towards the 4 hour mark. You will now have plain yogurt that you can add whatever you’d like into. Save about 4 ounces of this yogurt to start your next batch. You can re-culture your yogurt about 3-4 times with yogurt from the last batch. After this the cultures will be too weak and you will need a new set. One more thing: The consistency of homemade yogurt is thinner than the kind you buy in stores. You may find yourself asking, “How do I thicken my homemade yogurt?” I have worked and worked to find a way to thicken it up, (my family prefers it thicker). After much trial and error I’ve stumbled upon a couple of solutions. The first is to add unflavored gelatin to it before you incubate it. I’m not sure I like its texture this way. It’s kind of like…well…Jello. The second -my preferred method- is to use a product called Instant Clear Jel. It is a pre-cooked corn starch. Therefore you can put it in something cold and it will thicken it almost instantly, (think instant pudding). I have found that you use about 2 TBS to 1 cup of yogurt. Sprinkle it over the top, whisk it in good and let it set in the fridge for a while. Then, go back to it and whisk it again until it’s creamy and thick. My family thinks it’s perfection! Plain yogurt is also a great, healthy substitute for sour cream. You can also put the plain yogurt in a colander lined with cheesecloth and let the whey drain from it until you have yogurt cheese -which is a lot like cream cheese. You can make a quart of yogurt for the cost of the milk plus your culture, (which can be simply one individual cup of plain yogurt). Healthy, delicious, nutritious and inexpensive! On Food: Homemade Chocolate Syrup! Oh how I love beans! Kidneys, pinto’s black, white, cranberry, garbanzo and so many more I don’t have time to mention. They’re cheap, versatile, (did I mention musical?) and nutritious. Mixed with a grain you have a complete protein. What could be better? Beans are a staple food in our home. They are actually one of those foods we can buy organic almost as inexpensively as non-organic. We belong to a very local buying club that orders from Country Life Natural Foods. Their prices are great. We can buy a variety of dried beans for $1.10-$1.35/lb. 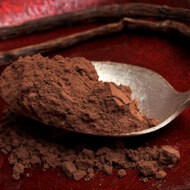 You can also find them fairly inexpensively in the bulk section of many health food stores. 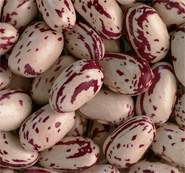 So, if you’re trying to buy organic and want to save money in the process choose dried beans over canned. Now, before I start you should know that there is all sorts of controversy over how to correctly cook beans. Soak or not soak? Use the soaking water or throw it out? Salt the water or leave the salt until later? I say, they’re BEANS for pete’s sake. If you want to get some expert advice on bean prep go to the Central Bean Co. I guess that’s all I have to say about that. Anyway, onward. You want the beans to be frozen somewhat individually so you can scoop out as many as you need for a recipe. So take a towel and carefully dry off each bean, place it gently in the freezer…just kidding. Really, it depends on how you want to store them in the freezer. If you want to store them in plastic freezer bags then put them in the bags and stack them flat on the freezer shelf so they are not in a clump but a thin(ish) layer. When they have completely frozen you can give the bag a good whack on the counter and they will break apart into separate beans and manageable clumps. If you are averse to plastic you can also store them in tempered glass jars in the freezer, (like canning jars). To do this you will want to freeze the beans on a cookie sheet first, scoop them off when frozen, put them in the jars and back to the freezer. Now you have beans all ready for a recipe. I usually scoop out what I need, (sometimes let them thaw a bit depending on the recipe) and I’m ready to go. I’ve found that since I’ve started doing this we eat beans on a more regular basis. I will close with this very interesting use for beans. I got this idea from a friend. Try substituting the butter for beans in a cookie recipe. Mash the beans really, really well, (white beans work best but any will do) and mix them in the dough instead of butter. It sounds crazy, but it really does work. You get higher protein, lower fat cookies with a few extra anti-oxidants. Try it!